Land Rover will mark its 70th anniversary with a series of events and celebrations in 2018, beginning with the restoration of the vehicle that started it all – one of the three pre-production Land Rovers shown at the 1948 Amsterdam Motor Show launch. This gave the world its first glimpse of the shape that would become instantly recognisable as a Land Rover. ​For years the whereabouts of this launch Land Rover was a mystery. The demonstration vehicle from the Amsterdam show was last on the road in the 1960s, after which it spent 20 years in a Welsh field before being bought as a restoration project; it then lay languishing unfinished in a garden. Following its surprise discovery just a few miles outside of Solihull, UK – where the car was first built – the experts at Jaguar Land Rover Classic spent months researching in company archives to unravel its ownership history and confirm its provenance. The team behind the successful Land Rover Series I Reborn programme, which allows customers to own a slice of Land Rover history with meticulously restored Series Is, will now embark on their most challenging project yet: a year-long mission to preserve this historically significant prototype and enable it to be driven again. ​This Land Rover is an irreplaceable piece of world automotive history and is as historically important as ‘Huey’, the first pre-production Land Rover. Beginning its sympathetic restoration here at Classic Works, where we can ensure it’s put back together precisely as it’s meant to be, is a fitting way to start Land Rover’s 70th anniversary year. There is something charming about the fact that exactly 70 years ago this vehicle would have been undergoing its final adjustments before being prepared for the 1948 Amsterdam Motor Show launch – where the world first saw the shape that’s now immediately recognised as a Land Rover. The Jaguar Land Rover Classic team will follow a dedicated process to restore the launch vehicle, which has a lot of special features that are unique to the 48 pre-production Land Rovers that were produced prior to the mass production vehicles, such as thicker aluminium alloy body panels, a galvanised chassis and a removable rear tub. The patina of its components will be preserved, including the original Light Green paint applied in 1948. 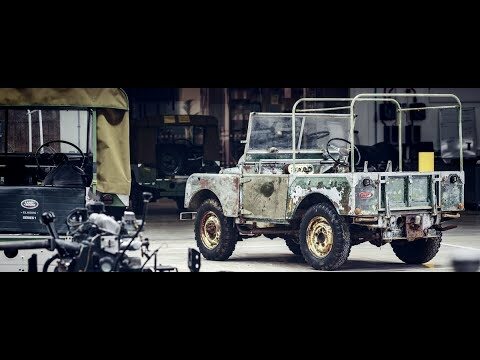 Previous owners of this historic vehicle are being invited to Jaguar Land Rover’s Classic Works facility to share their experiences and to witness its loving restoration. This landmark project, representing the earliest beginnings of the Land Rover story – which led to more than 67 years of continuous production of iconic Series I to Defender vehicles at Solihull – is the first in a series of stories and events that will celebrate the past, present and future of Land Rover throughout 2018. Follow the story on Instagram @LandRoverUKPR. Stay up to date with all the latest news from Helston Garages , including new model releases and more. Helston Garages Ltd is authorised and regulated by the Financial Conduct Authority for the broking of Consumer Credit and sale of insurance products under Firm Reference Number 313009. Helston Garages was founded in 1960 by Mr & Mrs Carr Snr, as a filling station and repairs workshop located in the small Cornish town of the same name. In the beginning, the business dealt in and serviced Austin, MG, and Morris cars.. Welcome to Helston Garages Group. To optimise your experience, cookie settings on the website are set to allow all cookies. By continuing your journey throughout the website, you consent to this. You can change these settings here.